Understanding of reinforced concrete developed rapidly throughout Europe from the turn of the 20th century, and also influenced American practice. The flexibility and strength of concrete, its fire resistance, and its ability to resist low tensile stress made it a popular building material for a range of structures (Cusack i). By the early 20th century, LG Mouchel commissions included landmark marine ventures such as Portland Harbour and London Docks, civic buildings  including Lion Chambers in Glasgow  as well as numerous bridges, chimneys and ships. Criticisms of the 'specialist monopoly' (and of Mouchel personally) were voiced by architects and engineers excluded by the agent system (on this and contemporary debates over patents see Cusack ii). In part these complaints were practical  architects untrained in the use of concrete often had their designs reworked by specialists like Mouchel  and resulted in the establishment of organisations committed to objective studies of reinforced concrete and the training of specialists. These include the RIBA Joint Committee on Reinforced Concrete (1905), Concrete & Constructional Engineering (1906) and The Concrete Institute (1908) (Cusack ii), this last becoming the Institution of Structural Engineers in 1922. Before 1910, the specialist system remained in force, however, and at its head was Mouchel. His links with Hennebique continued. As part of his contract, Mouchel paid two thirds of his fees to Hennebique, who carried out all the designs. This allowed Mouchel to retain one third of all fees for securing and overseeing the work and translating drawings into English. Mouchel also took over the employment of one of Hennebique's chief engineers  C. Roch  initially without Hennebique's knowledge. 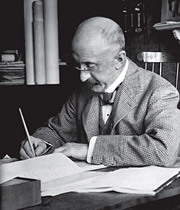 Mouchel and his engineers continued to attend several training courses at Hennebique's Paris office, and Mouchel was the main agent for Hennebique licences in Britain, but Mouchel also now negotiated for two-thirds of all UK fees to be retained by his own business. In addition, he began to patent his own reinforced-concrete designs that extended Hennebique's system. These included ferro-concrete 'hollow diaphragm piles'. Mouchel defended his new patents rigorously in the courts. 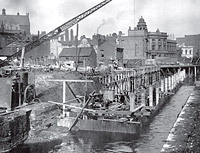 One hearing with French contractor Coignet for the use of hollow diaphragm piles in Bristol, after initially being awarded in Mouchel's favour, reached the Lord Chief Justice, who decreed that Hennebique had made a discovery rather than an invention. By the time the case reached the House of Lords, some of Mouchel's patents had run out, though the company had already established a reputation for quality engineering design. From this point, Hennebique/Mouchel could no longer claim exclusivity for many of their patents. This must explain the subsequent success of other systems of reinforced concrete construction. Despite the loss of Mouchel's hold on the development and use of reinforced concrete, the Mouchel-Hennebique connection had made its mark on the early 20th century British landscape. Between 1897 and 1899 there were only seven Hennebique-framed buildings commissioned in Britain. In 1908 alone there were 40 new such buildings. The following year there were some 1,000 total reinforced-concrete works in the UK, most of which were commercial and industrial, and 70% of which used Hennebique's system (Cusack i). Hansom Cab works (possibly 1898) in Newcastle-upon-Tyne  an early example of the Hennebique system. River Roch crossing (opened 1902) in Rochdale, Manchester. Load testing a new bridge in Aston, Birmingham. Mouchel stands on the bridge slightly left of centre. 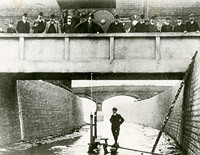 Mouchel's chief engineer, C. Roch (centre), inspects a ferro-concrete test  the structure had been loaded with pig iron and set on fire.